The U.S. Department of Labor (DOL) fosters, promotes, and develops the welfare of U.S. wage earners, job seekers, and retirees; improves working conditions; advances opportunities for profitable employment; and assures work-related benefits and rights. DOL carries out its mission through a number of offices and agencies, several of which offer programs and resources of interest to runaway and homeless youth service providers. These include the Employment and Training Administration (ETA), the Division of Youth Services, the Wage and Hour Division (WHD), and several interagency initiatives (such as Opening Doors). DOL is part of the U.S. Interagency Council on Homelessness, an independent federal agency within the U.S. executive branch that leads 19 federal member agencies in implementing the federal strategic plan to prevent and alleviate homelessness. 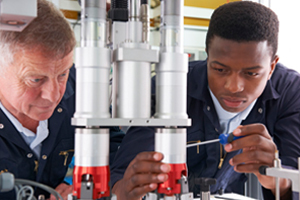 The Employment and Training Administration administers job training and worker dislocation programs, federal grants to states for public employment service programs, and unemployment insurance benefits. ETA provides information about summer youth jobs, the Workforce Innovation and Opportunity Act (WIOA), and other employment and training programs related to youth and youth homelessness. Within ETA, the Division of Youth Services coordinates all youth-related workforce programs, including the WIOA Youth Formula, YouthBuild, and reentry employment opportunities. The WIOA Youth Formula Program serves eligible youth, ages 14-24, who face barriers to education, training, and employment. Funds for youth services are allocated to states and local areas based on a formula. The WIOA program focuses primarily on out-of-school youth (OSY), requiring local areas to expend a minimum of 75% of WIOA youth funds on OSY. YouthBuild is a community-based alternative education program that provides job training and educational opportunities for at-risk youth ages 16-24. Youth learn construction skills while constructing or rehabilitating affordable housing for low-income or homeless families in their own neighborhoods. The Wage and Hour Division enforces the Federal minimum wage, overtime pay, recordkeeping, and child labor requirements under the Fair Labor Standards Act. As part of this endeavor, WHD oversees YouthRules!, an initiative to increase public awareness of federal and state rules concerning young workers. Through the YouthRules! Initiative, DOL and its partners seek to promote positive and safe work experiences that help prepare young workers in the 21st Century workforce. Several resources can be leveraged by runaway and homeless youth providers to understand rules for young workers. The Young Worker Toolkit provides information about the various laws WHD enforces as it relates to young workers. Resources include youth employment rules, paid vs. unpaid internships, child labor fact sheets, and youth employment presentations, among others. Young workers are limited to the types of jobs and number of hours they can work. As rules vary by age group, YouthRules! provides resources for youth under the age of 14, between 14 and 15 years old, between 16 and 17 years old, and over the age of 18.